A revival broke out in the Netherlands recently - and its focus should capture our attention. 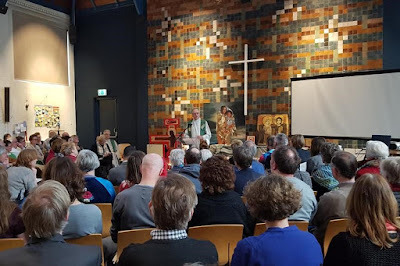 For 96 days, a Dutch church has held a continuous worship service. Around the clock for more than three months! This remarkable service required the assistance of more than 1,000 ministers. And why did they hold this service? Why was the Spirit moving so long? To protect a refugee family. The Dutch government was going to deport a refugee family back to Armenia. But the Netherlands has a rule that it will not arrest people during a religious service. So, Bethel Church stepped up and starting housing the family while holding a nonstop worship service. That's love of God and neighbors! That's true worship! The service ended after the government changed its mind about the family and up to 700 other refugee families. Love won! Although the service has ended after 96 days, one of the pastors who led the effort sees more coming from this revival. "This is just the beginning," Derk Stegeman told the New York Times. "I hope it's a new way of being a church - a new way of having an impact on society, a new way of standing up for vulnerable people." Amen! May we see more radical acts of worship!